This weekend, I had a chance to take a Flux Mopeds EM1 electric scooter out for an extended test ride. This is the 2014 model, which features a few upgrades from their previous version, including a higher voltage battery pack, regenerative braking, and improved motor control. Overall, this is a very likable vehicle. The scooter is technically a “moped”, so keep in mind that it’s in the same class as a 50cc gasoline scooter. That means you don’t need a motorcycle license to ride it, you can park it at a bike rack, and registration is very affordable. (Keep in mind that laws on mopeds vary from one state to another, so check for your local laws.) The scooter comes with a 74V 24AH lithium battery, which is enough to take you 20-25 miles. If that isn’t enough for you, you can get an optional SECOND battery to double your range. My demo unit had both batteries, but I found that in my driving, I would have been fine with just the one. The EM1 uses a 1500 watt brushless DC rear hub motor. While 2 HP doesn’t sound like a lot, it has a surprising amount of torque, and brought me up to 30 MPH pretty quickly. One of the great advantages of a hub motor is that there’s no chain. That means no chain NOISE and no chain maintenance or replacement. I had several events that I had to get to this weekend – everything from running errands to attending a family reunion. The weather looked good, so I gave the scooter a workout. I did three maim trips of 14, 17.5, and 8.4 miles. On one of those, I was riding in the dark and intentionally taking a route that included a very large hill. The scooter slowed a bit on the hill, but did NOT feel overtaxed or otherwise negatively affected. The headlight offered fine night illumination. My first trip was running errands. I went to the post office, library, and auto-parts store. At the post office, I was able to parallel park in a spot that a car wouldn’t have fit. Likewise, the library has a tight parking lot, so I instead parked right at the bike rack. When I was done at the library, it was almost hard to leave because of interest in the cycle from other library patrons. At the auto parts store, I bought 5 quarts of oil and a filter for an oil change on my truck. I simply bungeed the oil bottle to the rear cargo rack. Other trips on the scooter were to some family events. The cycle is great in city traffic. It easily accelerates and keeps up. Acceleration is very smooth. The scooter is so quiet, I could listen to conversations of pedestrians. Charging on the Flux is pretty slick. The scooter features a removable battery pack and an external charger. The battery pack weighs just over twenty pounds and lifts right out from under the seat. You plug the charger into the pack and into the wall outlet and then turn it on. The five amp charger will bring the pack to full capacity in less than five hours. In my usage, it never needed more than about two and a half hours to full. At maximum draw, the charger used just over 400 watts. I found this interesting because I happen to have a 400 watt PV solar panel at my house. I tracked my total energy usage for the scooter AND total energy creation from the PV for the weekend. Sure enough, I made more energy with the solar panel than I used on the scooter. 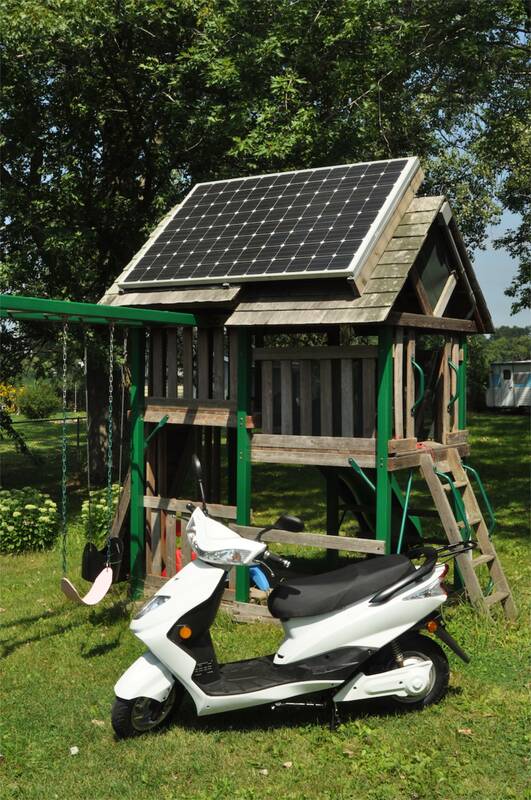 I think that in this case, it would be fair to call it a “solar-powered scooter”. The removable battery pack system allows people to wouldn’t otherwise have access to electricity in a garage or parking lot to be able to charge. For example, anyone living in an apartment or dormatory can simply bring their battery pack indoors to charge. This would be great for charging at work or anywhere else that you spend time, but don’t have access to outdoor electric outlets. If you ride in cold weather, it also means that your battery has been indoors all night and is already toasty warm, too! In short, the removable battery eliminates the need for a garage or public EV charging. Even with two batteries in place, there’s still just enough room under the seat for the off-board charger. It was nice to have a place for it to keep the charger with me. Although I didn’t need it and didn’t use it, it was still nice to have with for peace of mind. With two batteries and the charger, I had ZERO range anxiety while using the scooter. List price on the 2014 EM-1 is $2399. (The original version is still available as well at $1999.) 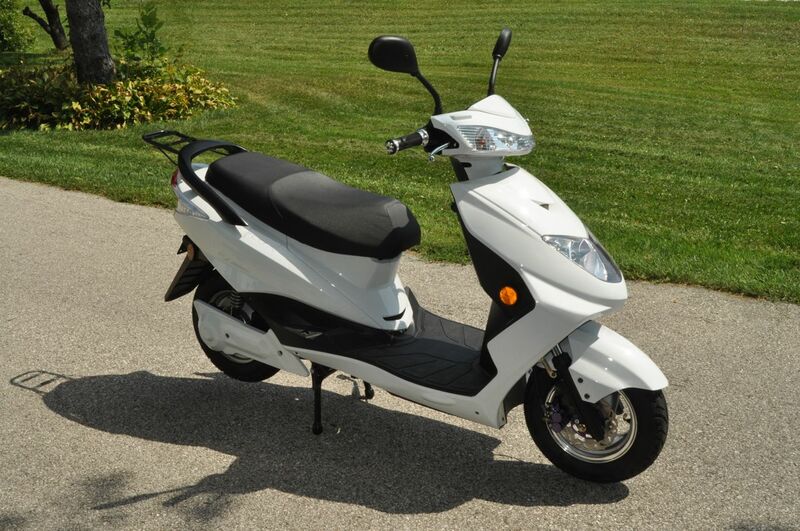 For comparison, a 49CC 2013 Honda Ruckus goes for $2,649, and a 2013 Metropolitan base goes for $1999. On the other hand, by going electric you also have no gasoline cost, no oil changes, and never have to learn how to fix a carburetor. EVER. I tracked my miles and electric use for the weekend and found that I had traveled 39.9 miles on 2.92 Kwh of electricity. Assuming that gasoline has 33.41 KWH of energy in it, that means that I used 1/11.44th of a gallon of gas to go 39.9 miles. Thus, on a gallon of gasoline, I could have gone 456 miles. Hmmm. Not bad. I don’t know anyone driving a Prius getting 456 miles per gallon! To be completely fair, that’s still a little bit of an “apples and oranges” comparison, but it really shows how EVs are champs in the efficiency department! Overall, it’s really hard not to like the Flux Mopeds EM1. It’s simple to run, fun to ride, and cheap to operate. It excels in the city and solves the “chicken and egg” problem of charging. Two-wheeled EVs are also great for people who still want to keep their gas car, but don’t have room or money for a full-size electric car. The EM1 is appropriate technology for the modern world, an affordable electric that everyone will like. You owe it to yourself to go test-ride one. I appreciate the review. Good size and price range for students lugging back and forth to campus and residence. One small step for but one giant leap for the electron. Glad to see you are now riding ATGATT. Looks like a nice jacket. Have you reviewed it? No, I haven’t reviewed the jacket. I’ve been pretty happy with it overall though. I like scooters quite a bit, but I think that one problem with them is that riders don’t always take safety seriously. 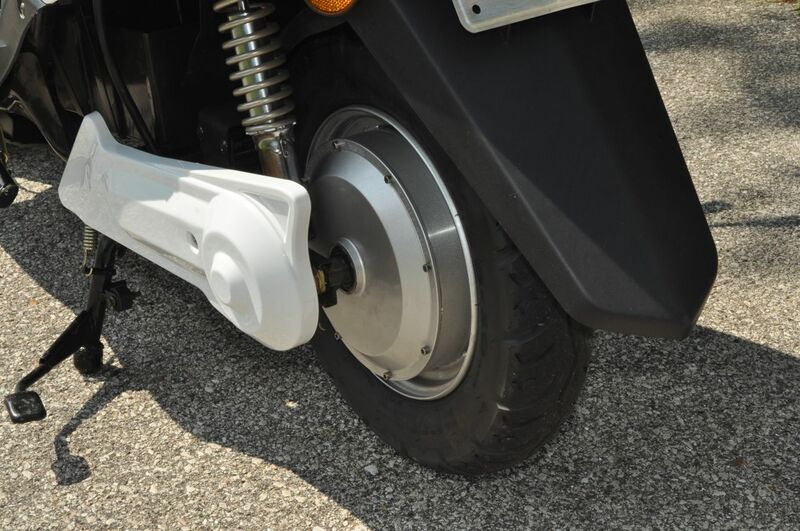 Why is it OK to wear flip-flops on a scooter but not a motorcycle? It’s not! I’m interested in getting one of these, and I’ve put a lot of research into the purchase plan for getting it! One of the things I’m wondering is about the acceleration and passenger weight handling. If you don’t mind me asking, how much do you weigh? It would be nice to have an acceleration profile in mind for your weight and compare that to myself to kind of remind myself that it’ll be fine! I weigh almost 200 lbs. Acceleration on the electric scooter is BETTER than on a gas 50cc scooter. I didn’t test this scooter with a passenger on it. By law, 50cc style scooters are NOT supposed to have passengers, and really are not designed for them. Only larger scooters (which are technically considered motorcycles, and require a motorcycle license) are designed for passengers. Those large scooters are great, but a BIG jump up in price. For all-purpose clean transporation, you can’t beat a Flux Mopeds EM1 on price or utility. Next post: Electric Motorcycle DVD Now Streaming!